Whether you touched something hot or got splattered with cooking oil, burns are not fun. Luckily, most household burns are fairly minor and can be treated at home. Rather than spending a lot of money on special burn treatments, why not try one of our home remedies for burns? Odds are you already have some of the ingredients in your pantry. For instant relief to accelerated healing, these home remedies will have your skin feeling better in no time at all. Your first instinct may be to put ice on your burned skin, but that can actually make the situation worse. Ice can damage nerve endings and prevent optimal healing. Rather, running cool water over the burned area will lessen the immediate pain, and stop the damage from getting worse. It’s less of a shock to damaged tissue and provides gentle relief while also cleaning the wound. Turn on the cold water tap in a sink or tub and hold the burned area under the stream of water. Keep it there for at least 7-10 minutes for the best results. This is one of the more old-fashioned home remedies for burns, but that’s because it works. One study published by the Europe PMC found that applying vinegar to a burn neutralizes the reaction and will help your skin heal faster than using running water alone. In addition to helping skin heal, common household vinegar has natural anti-septic and astringent properties to kill bacteria. This helps keep your burn from getting infected. Dip cotton balls in vinegar and gently dab on burned areas. Let dry, then repeat. Do not cover the burn, or wash off vinegar. Repeat every hour. You may have heard of using banana peels for a burn, but according to a study conducted in India, banana leaves are actually much more effective. They not only reduce the amount of pain in the affected area, but also help to speed up healing. The large leaves are also smooth and cool, offering further relief from pain. This is a great remedy for thicker burns or those that cover a large surface area. Cut banana leaves to a size slightly larger than the area of your burn. Lay them over the affected area. Wrap with gauze, but be careful not to wrap the dressing too tight. In addition to being one of the most popular home remedies for burns, boiled potato peels have been used in hospitals for a very long time. One study asserted that treating burns with boiled potato peels under a gauze wrapping sped up the recovery time and reduced pain and scarring when compared to plain gauze bandages. One component of this is that the potato peels keep the affected area hydrated. Burned skin dries out very easily, making scarring worse and healing a lengthy process. The potato peels must be boiled to release the majority of their starch, which can dry skin further. Bring water to a boil and then add the potato peels. Boil for 5 minutes, then drain. Let cool, apply to burned areas and wrap with gauze bandages. Aloe vera is one of the most famous home remedies for burns, and is particularly effective for providing pain relief for first or second degree burns. One study published in the Journal of the International Society for Burn Injuries found that treating burns with aloe vera gel also reduced healing time by over a week when compared to other remedies. There are commercially available gels and ointments containing aloe, but for the best results you should use a fresh aloe cutting. This is why aloe is one of the most convenient home remedies for burns. Gently apply fresh aloe vera gel to affected areas and then let dry. Loosely cover with a gauze bandage. Repeat every 4 hours. Black tea contains tannic acid, which works to significantly reduce the pain of a burn. The caffeine also helps to stimulate circulation in the skin, speeding up recovery time. There are several ways of using black tea to soothe a burn, but you should always use fresh tea bags rather than recycled ones. If you have some time, it’s recommended to use steeped tea. However, for a quicker and more mobile remedy, a poultice is sufficient. Bring the water to a boil, and then steep the tea bags for ten minutes. Let the tea cool, then soak affected areas for 20 minutes. Repeat daily. Alternatively, soak tea bags in cool water for one minute. Press on affected areas and secure with gauze bandages. Honey is not just one of the most delicious home remedies for burns, but also quite an effective one. The naturally anti-septic and anti-bacterial properties of honey make it great for fighting off infection, as well as helping burns heal faster. One study published in the BMC Journal of Complementary and Alternative Medicine stated that honey is as effective as standard medical dressings when it comes to pain management and healing. For the best results, be sure to use the highest quality raw honey you can find. Apply a thin layer of raw honey to affected areas. Wrap loosely with gauze bandage. Repeat three times a day. Baking soda helps to restore the pH balance to burned skin. It leaves you with a cooling sensation wherever you apply it, helping pain to dissipate almost instantly. In addition to helping relieve pain, the anti-bacterial properties of baking soda help prevent infection and can keep bacteria from coming in to contact with affected areas. Then, the naturally whitening properties of baking soda also help to reduce the chances of scars being left behind. Mix baking soda and water to form a paste. Apply to burned skin and let dry. Once dry, rinse off and reapply. 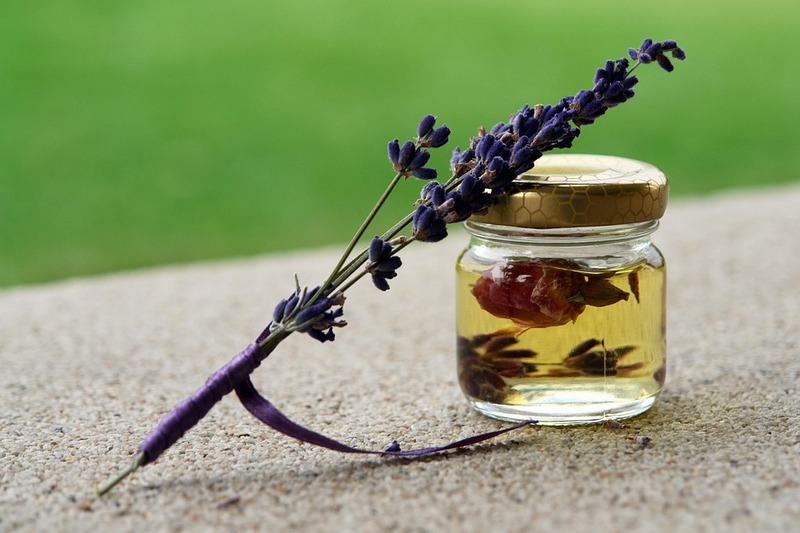 Lavender oil has soothing properties, helping to reduce the pain associated with burns almost instantly. It will also help prevent blistering and peeling, reducing the chances of scarring later. In its undiluted form, lavender oil can irritate sensitive skin, so it’s best to try a drop or two on unaffected skin before applying it to a burn. Pour 5-6 drops of lavender oil on a cotton ball. Gently dab on affected areas. Repeat once an hour. If you are worried about small burns that might leave scarring, you should definitely try this home remedy. Coconut oil has a ton of vitamins and fatty acids that speed up the healing process. They also have anti-oxidant and anti-fungal properties to protect against infection. Lemon juice, on the other hand, has citric acid. Citric acid works to naturally lighten the appearance of scars, making them less noticeable. This remedy is best used a few hours or a day after the initial burn, as immediate application may make pain worse. Mix coconut oil and lemon juice together. Gently massage into burned areas, then let dry. Reapply every three hours. Onions have a large variety of health benefits. When used in home remedies for burns, they can not only help relieve pain, but also reduce healing time and prevent blisters. One recent study suggested that onion also contains compounds that will reduce the chances of scarring. However, if you do use onion to treat a burn, be sure to use a new one in order to get the highest benefit. Slice the onion in half. Gently rub the cut side of the onion over affected areas. Repeat every few hours with a new onion. If you’ve ever had a small burn before, you know that the healing process can be itchy. However, scratching at a healing burn can cause the skin to break, lengthening healing time and opening your wound up to infection. Instead, try using oatmeal to relieve the itch and also provide some pain relief. It’s best to use traditional oats rather than preservative and additive-laden instant oats. For larger burns, soaking in a tub is recommended, but this remedy can be used on just about any part of the body. Stir oats into warm water and let sit for five minutes. Submerge burned area in oats and let soak 15-20 minutes. Allow area to air dry, then leave dried oats on skin for 30 minutes. Rinse with cool water and let air dry. Repeat twice a day. Burns happen. Whether you touch a hot pan without a potholder, get splattered with cooking oil or have a mishap with a curling iron, there’s no stopping these minor irritations from happening. However, with these home remedies for burns, there is something you can do about the pain, scarring and healing time. Most of these remedies use ingredients you already have at home, so there’s no need to prolong the pain by making a trip to the store. Do you have a favorite home remedy for burns? If so, we’d love to hear about it, so share with us in the comments below!